We are introducing this fish dish my husband made the other day. 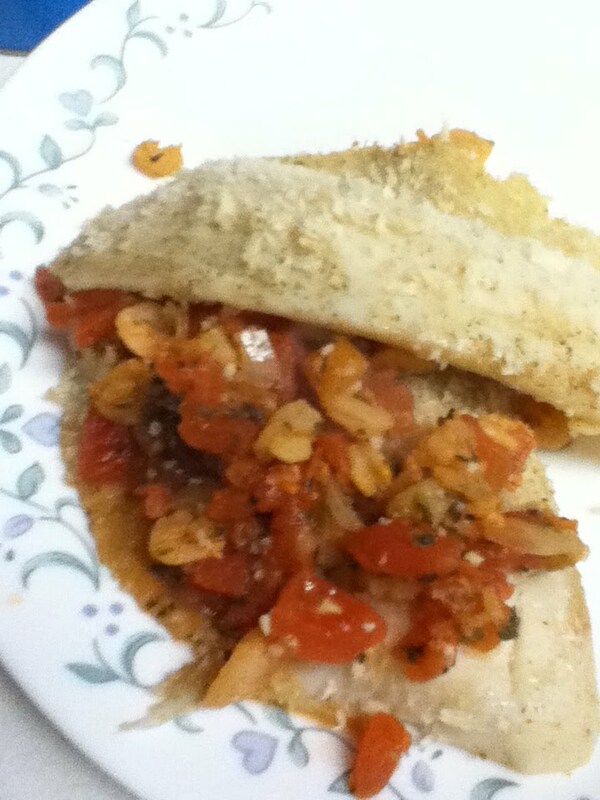 It shrimp stuffing layered between two pieces of fish. I would consider this healthy and tasty. Mix all ingredients, heat on medium heat on stove top until hot. To plate, place fish on plate, add 1/2 cup stuffing on top fish, top with another piece of fish. Looks really good. Thanks for sharing with Simply Delish. What a special recipe, it looks delicious and I can't wait to try it. Hope you are having a great week end and thank you so much for sharing with Full Plate Thursday. I am trying to make more fish at home and this is a must try! Thanks for linking up to Mangia Mondays! That looks and sounds so delicious! Tilapia is such a safe fish to play around with and try new things with. It's also mild tasting so most everyone in my family will eat it. Thanks for linking up and playing for our Friday Food fight. Hope you join us again this week!